Bouldering is having its moment. Climbing’s simplest discipline is experiencing a rush of new enthusiasts, in large part due to how accessible it is. All you need is a pair of shoes and a chalk bag—until the lure of real rock brings you outside, that is. 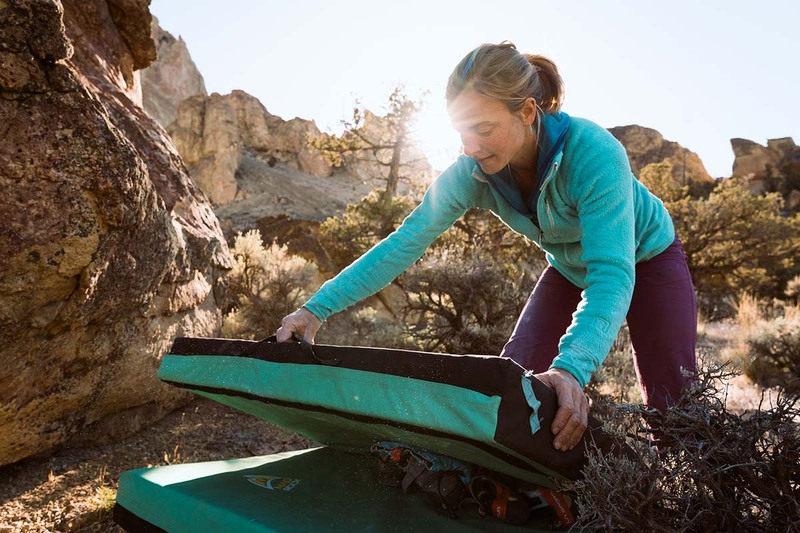 For outdoor bouldering, a crash pad (or multiple pads) is vital to climbing safely. And there are more options now than ever before, from stylish custom pieces to popular designs from heavy hitters like Metolius and Black Diamond. 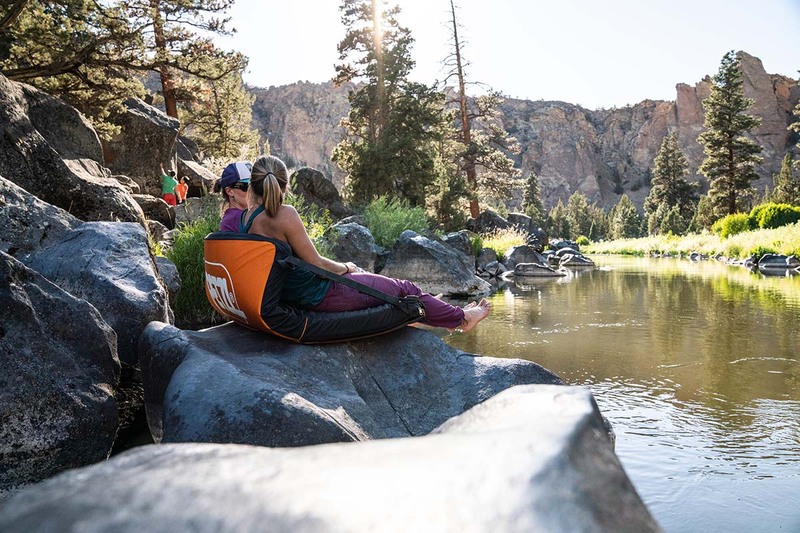 Below are the best crash pads of 2019, from supplemental to oversized and every size in between. For more background information, see our comparison table and buying advice after the picks. Open dimensions: 46 x 58 in. What we like: Nothing beats Organic foam. What we don’t: Heavy and poor traction on uneven surfaces. 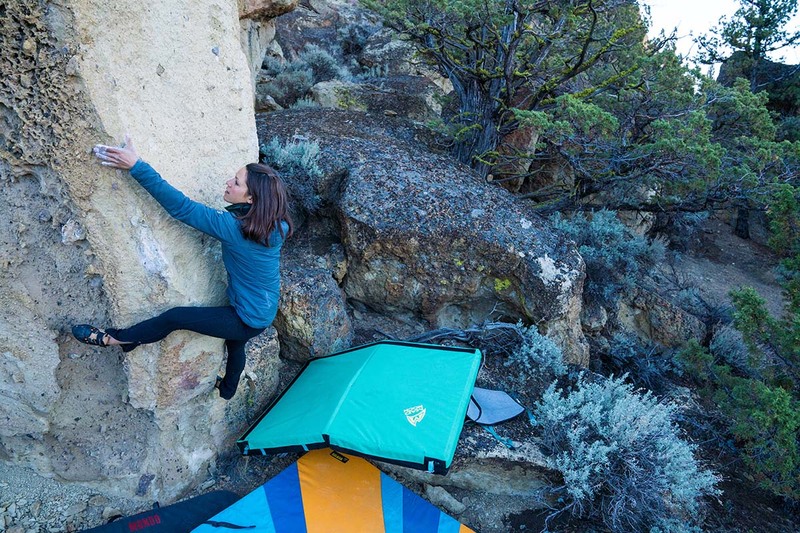 Organic Climbing’s Big Pad gets our top spot for 2019, boasting what is widely accepted as the best foam in the game. What sets it apart is the three-layer design consisting of memory foam, closed-cell foam, and open-cell foam, which strikes an impressive balance of cushioning and longevity. In particular, we think the memory foam top is a brilliant material—it compresses well while still holding its loft, and does not wear out as quickly as the open-cell foam that you find on most competitors. Organic makes each of their pads to order, so you can personalize your Big Pad with unique colors (and even request certain patterns or shapes) and decide between 4-inch and 5-inch thicknesses. What are the shortcomings of the Big Pad? Some find Organic foam to be on the stiffer side, and a break-in period certainly is required before it feels cushioned. Furthermore, the Big Pad is heavy and simpler than most—those who prefer extra pockets or organizational features won’t find them here. Lastly, on uneven landing surfaces the traction of the Organic is poor. Used on the same terrain, our Black Diamond Mondo stayed put under impact while the Big Pad slid around. But it nails the most important part of the equation: foam quality. And as a bonus, the company sells replacement foam so you can minimize waste and reuse your beloved pad cover. Open dimensions: 42 x 56 in. What we like: Flap design allows you to carry two pads securely. What we don’t: Excessive straps and fabric get in the way once unpacked. Carrying two crash pads can be cumbersome, and sometimes the setup is so insecure that you drop one halfway through the approach. But with a simple flap that extends over a second pad of any size, the Mad Rock Duo makes carrying multiple pads a non-issue. It’s a small feature, but enough to make the Mad Rock one of our favorites. It doesn’t hurt that the Duo is well cushioned with a beefy and adjustable suspension and weather-resistant fabric. And like most Mad Rock designs, it’s a thick 5 inches and has Velcro strips to connect to other pads for continuous flooring. The Duo’s strong suit also creates one of its downsides. Once unpacked, a mess of straps and flaps hang off the pad. In addition, the padding is cushier than the Organic Big Pad above or Black Diamond Mondo below, with a tendency to grow softer over time. The nylon face fabric is much less durable than the competition, and the Duo is heavy for a full pad, although its beefy suspension makes for comfortable carrying even with the addition of a second. But if you’re routinely toting multiple pads to boulder fields, the Duo is certainly one to consider. Open dimensions: 36 x 48 in. What we like: A quality crash pad for a low cost; built-in carpet for cleaning shoes. What we don’t: Foam is softer than most and the fabric isn’t particularly durable. The Session is the most affordable pad on our list, but Metolius didn’t hold back in terms of design. We especially like the angled fold with Velcro reinforcement—unique to Metolius pads—that has all the benefits of a hinge design but diminishes the possibility of hitting the “gutter” during a fall, even on uneven terrain. The lightly updated II also has two additional webbing handles to make it easier to drag when unfolded. Further, the bottom and side flaps now secure easily with just one buckle and are simple to adjust to protect the shoulder straps while bouldering. Like all Metolius pads, the Session has a handy carpet patch to clean your shoes off before climbing. Keep in mind that Metolius’s foam definitely is softer than most, making this pad best suited for small falls. You’ll risk bottoming out if you fall from high, but its small 36 x 48-inch footprint is meant for shorter problems anyways. Furthermore, the Session has some of the least durable shell fabric on the list. But for $149, you just can’t beat the value—it’s ideal for a range of boulderers from those testing the waters of the sport to seasoned veterans looking to supplement their oversized rig. And because it’s so lightweight and quick to pack up, the Session is an ideal pad for circuiting too. Open dimensions: 44 x 65 in. Weight: 20 lbs. 6 oz. What we like: Confidence inspiring size; stays put on uneven terrain. What we don’t: Expensive and not super durable. Black Diamond’s Mondo is an undisputed favorite and for good reason. Almost 20 square feet of 5-inch foam makes this an incredibly confidence-inspiring pad to have below you. The Mondo stays put on uneven ground better than you’d expect given its thickness and rigidity—the bottom is coated with rubber for better grip, and the base layer of open-cell foam conforms well to the ground. It’s simple too, something we love in a pad, with easy-to-clip buckles and few added frills. What are some pitfalls of the Black Diamond Mondo? First, it’s a full $100 more than the custom-made Organic Big Pad above. Second, the large size means it’s not for everyone and may not even fit in your vehicle. And considering its 20-pound heft, we wish the shoulder straps were adjustable and more padded—the Mondo is a bear to carry for long distances. Last but not least, durability is a concern. The cushy, open-cell foam on the bottom will wear away faster than closed-cell foam would, and reports of fabric ripping at strap attachment points give us pause. But for many, these drawbacks are worth the solid confidence boost of the large and burly Mondo. Open dimensions: 38 x 50 in. Weight: 16 lbs. 8 oz. What we like: Flashed Air Technology is durable and just works. The Flashed Ronin is unlike any other crash pad on the market. Their innovative Flashed Air Technology (FAT), which amounts to a series of cells that “self-inflate” around a small central foam core, provides a soft yet substantial landing zone. Hit it hard and it stiffens, hit it lightly and you’ll get a cushioned catch. Either way, you won’t bounce like you might on a standard crash pad. Flashed claims that this technology lasts three times longer than open-cell foam, and we believe it. We tested a well-loved 5-year-old pad with FAT and it was as beefy and cushioned as our new pads. 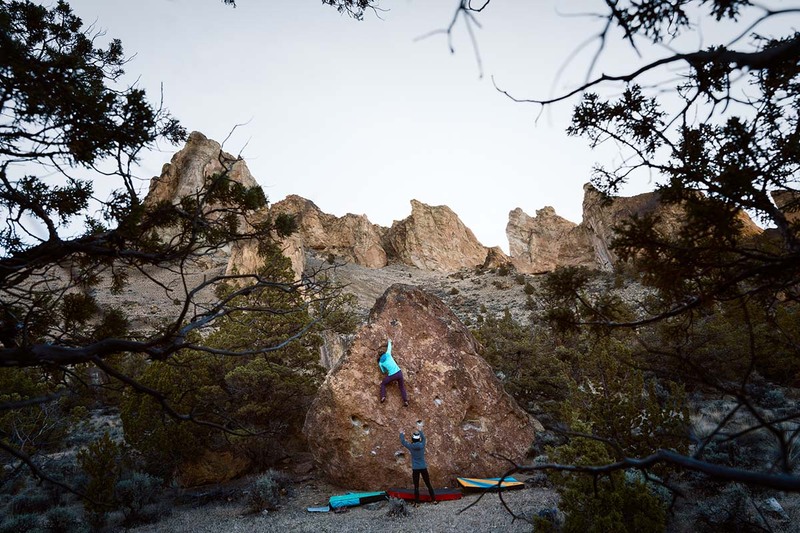 Flashed predicts that their technology will “change bouldering as we know it,” but we have yet to see it truly alter the market. It’s hard to say why—the pad is durable, has been diligently tested, and can even be compressed to meet standard baggage measurements for air travel. It could be that Flashed is a bit off the radar being based in Canada (although they ship their pads to the U.S. for a reasonable fee). And the Ronin is expensive for a full pad ($375 USD with the exchange rate at time of publishing) and heavy for its size. It might be an outlier, but we have yet to meet anyone who doesn’t love their Flashed pad. Open dimensions: 41 x 58 in. What we like: Simple and functional. What we don’t: Suspension system is not adjustable. Asana pads are the old standbys of the bouldering world. Nothing on the Super Hero is advanced: Asana still uses cumbersome cam straps for the closure system, a simple hinge fold, and standard sandwiched foam. But with 1000D ballistic nylon, sturdy buckles, and padded shoulder straps, the Super Hero gets the job done. A flap closure allows you to securely carry gear or attach another pad without too many shenanigans. 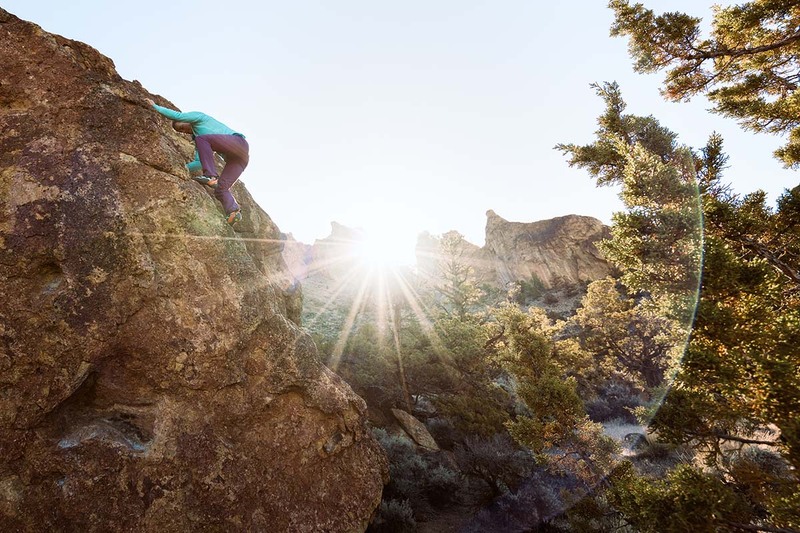 And Asana is one of the only brands out there truly dedicated to bouldering, and their expertise shines through. The Super Hero covers the basics so well it leaves us with little to complain about. Sure, the foam isn’t as revolutionary as Organic’s, and yes, the flap closure is neither as convenient as the Mondo’s simple buckles nor as secure as the Alto’s zipper closure. The price tag is pretty middle-of-the-road as well, yet it’s competitive at under $300. One change we’d like to see is an adjustable suspension system for easier carrying. But for boulderers who appreciate a simple, eye-catching pad that will stand the test of time, the Asana shouldn’t disappoint. Open dimensions: 48 x 60 in. What we like: Great taco design with a plush velvet top. What we don’t: Expensive and without a high-grip bottom. As far as taco pads go, VooDoo makes some of the best. Unlike other hinge-less pads, this one longs to be in the open position. The 5-inch VooDoo springs outwards and lays flat immediately, with no tricky gutter to speak of. New versions are made with 5 aluminum buckles (beware of the older models with plastic buckles) to help you wrangle the pad shut, and the velvet top is great for both cleaning shoes and providing an extra dose of comfort for your fall. At $450, the Highball 5000 is no small investment, and it’s no small pad either. But if you’re in the market for a large pad, it’s certainly competitive with the BD Mondo above. The taco fold, more durable fabric, and velvet topper all are notable features, but it lacks the high-grip bottom and costs $50 more. VooDoo also makes three smaller models with 4-inch foam (the 3000, 4000, and Royale) that’ll save you some cash and space in your car. Open dimensions: 41 x 48 in. 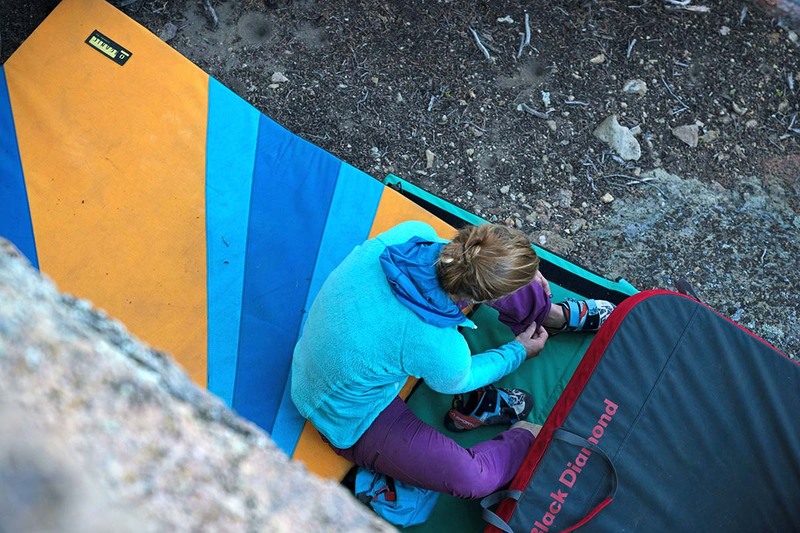 What we like: Lightweight; can drape over boulders and wrap around trees. What we don’t: Not a great standalone pad. The Drop Zone fills a gap in most pad collections, providing a lightweight, hinge-less addition to standard ground protection. At only 9 pounds 8 ounces, it makes toting a second pad a bit less arduous, and it’s a great option if you're with kids who want to help with the carrying process. On the way to the boulders, the elastic mesh flap can secure a lot of gear inside the cavernous taco fold. Like its big brother, the Mondo above, the Drop Zone has a rubber-coated bottom for solid grip on uneven terrain and a polyurethane-coated top for durability and weather protection. With the Drop Zone’s taco-style fold, you do give up a bit of convenience. It does not lay flat when first opened, and you’ll want to store it open so as not to damage the foam. At only 3.5-inches thick, we wouldn’t recommend it as a standalone pad unless you’re staying low to the ground. Additionally, less foam to absorb each fall means it’s bound to wear out quicker than most. This all means that we like the Drop Zone most as a top layer to cover gaps and as a hinge-less option that can drape over sharp rocks or wrap around trees. Weight: 13 lbs. 3 oz. What we like: A durable pad at a budget price. What we don’t: Some of the features are cumbersome. 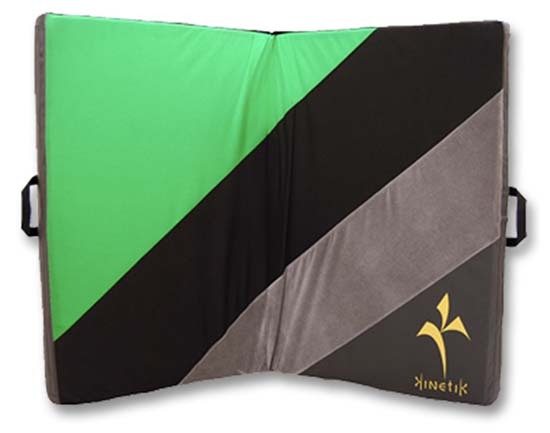 Kinetik’s Newton is the tank of crash pads, with utility and durability emphasized above all else. The exterior is made of burly 1680D ballistic nylon—far and away the most protective fabric we see on crash pads—and the bottom and flap cover are an extremely strong waterproof vinyl. Instead of buckles and straps, the Newton is designed with flaps that secure with industrial-grade Velcro, wrapping around to cover the suspension system when unpacked. A 1-inch continuous layer of closed-cell foam covers the Newton’s hinge, eliminating the gutter and dispersing the force of a fall. The Newton is durable and practical but borders on being overly cumbersome. The strong Velcro is difficult to undo and has a tendency to stick to things that you don’t want it to (your car upholstery, for example). Furthermore, the flaps can get in the way unless stowed correctly. But if you’re willing to put up with these quirks, you’ll get good foam that is safely cocooned and all the features you need, including adjustable shoulder straps. For only $190, this pad is a good investment that, unlike the Metolius Session above or Mad Pad below, should stand the test of time. Open dimensions: 39 x 49 in. What we like: Feature-rich and carries gear easily. What we don’t: Overbuilt for a crash pad. 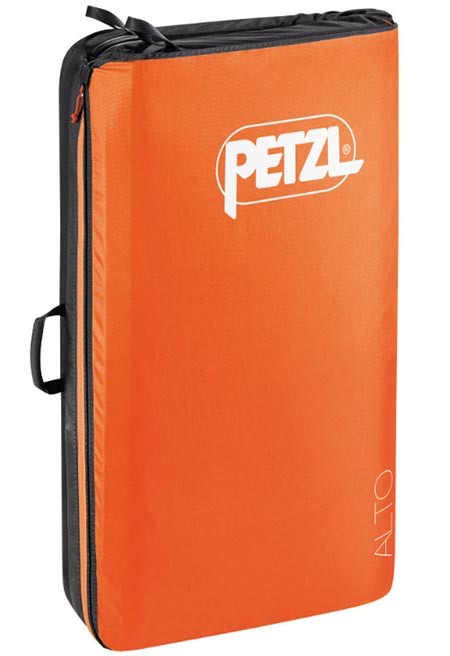 True to form, Petzl designed an innovative crash pad with the utmost attention to detail. The Alto answers just about every gripe boulderers have about their pads: “my gear falls out the bottom,” “the hinge creates a weak spot,” “the shoulder straps catch when I’m trying to drag my pad.” Not so on the Alto. The unique zipper design allows you to securely carry your gear and compresses the taco fold better than most. 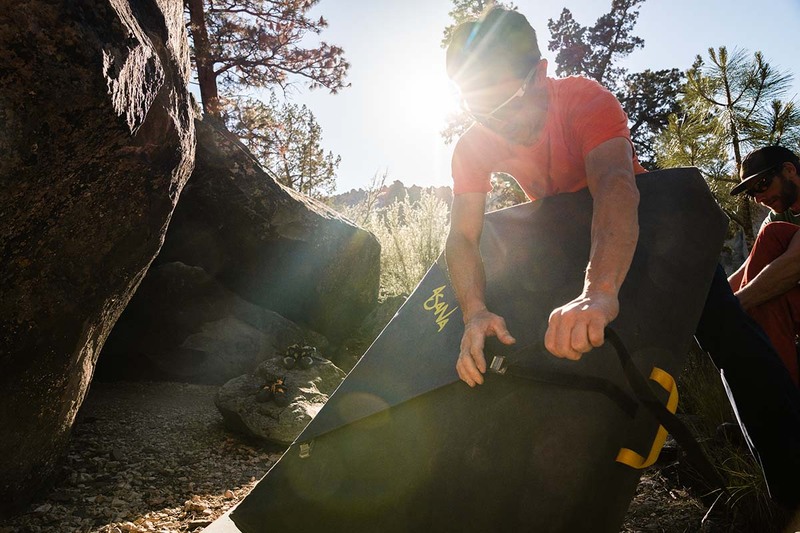 Once at the boulders, a flap zips around the suspension system to create a sleek, gutterless pad that can be flipped over and used on either side. All that, and we’re still not convinced the Alto is a standout. In short, it’s too complicated. The pad is arduous to set up relative to other pads and can be difficult to drag. Plus, we worry about the durability of the zipper closure—we’ve seen a Cirro (the largest Petzl pad) with a broken zipper that rendered the pad nearly impossible to transport. What’s more, the Velcro suspension doesn’t adjust to fit various body sizes. The Alto certainly is well made, but at nearly twice the cost of the Metolius Session II above, we have a hard time recommending it to all but the techiest of boulderers. Open dimensions: 37 x 50 in. Weight: 13 lbs. 13 oz. What we like: Thicker and slightly larger than the Metolius Session II. What we don’t: Mad Rock foam is not super durable. Similar to the Metolius Session II above, the Mad Rock Mad Pad is great for new boulderers or those looking for an affordable second pad. It has a slightly larger footprint than the Session and is made with Mad Rock’s standard 5-inch sandwiched foam (rather than the 4-inch thickness of the Metolius). And like all other Mad Rock pads, it features Velcro for continuous flooring and can be converted into a couch. At well under $200, you get what you pay for with the Mad Pad. The shoulder straps aren’t adjustable and the fabric is the least durable of any pad here. As we mentioned with the Duo above, Mad Rock’s foam starts out nice and cushioned but unfortunately does not stand the test of time. With 5 inches of foam rather than 4, the Mad Pad could last you longer than Metolius’ entry-level offering, but that’s only if the face fabric doesn’t fail first. 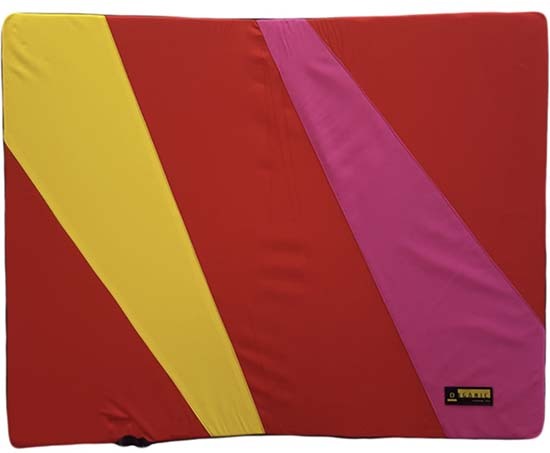 But for those who bouldering infrequently or just want a simple design for a few years before making a larger investment, the Mad Pad is a good contender for best budget design. Open dimensions: 42 x 60 in. Weight: 14 lbs. 5 oz. What we like: Small packed size and its angled hinges nearly eliminate gutters. What we don’t: Does not carry gear well. If space is at a premium in your life, a tri-fold design like the Metolius Recon makes a lot of sense. For a full pad, the Recon’s 22-inch folded width is impressive (compare that to the Asana Super Hero, which has a slightly smaller footprint but packs away to 29 inches in width). And with Velcro that effectively seals up the two angled hinge folds, the gutter problem is nearly eliminated as well. 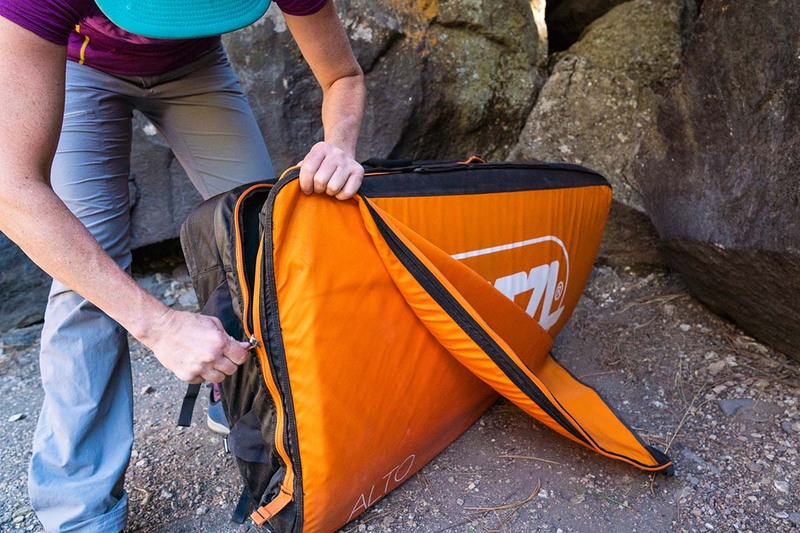 All told, the Recon’s accordion design is easy to pack and unpack, and the closure flaps invert to keep the suspension system clean while bouldering. The Recon’s tri-fold design does come with a few compromises. For one, it does not pack gear well—you’ll barely be able to fit a pair of shoes and chalk bag within the folds. Second, the Velcro-sealed hinges make for a rigid surface with minimal grip that does not stick well to uneven ground (we usually prefer a taco design to cover complicated landings). That said, if you keep the hinges unsealed, on the right terrain the narrow panels conform to boulders where many standard pads (like the Mondo) would extend over air. For the same style in an oversized version, check out the Magnum, which measures 47 x 70 inches and packs down to a 25-inch width. Open dimensions: 44 x 74 in. What we like: Extremely versatile supplemental pad. What we don’t: Not always necessary for small boulders or flat landings. The Asana Pro Spotter is a supplemental pad that packs an impressive number of functions into a compact size. At 3 inches thick when folded up—effectively the size of the unpacked Organic Briefcase pad below—it makes a great sit start pad or can give your full pad a boost by sliding it underneath. Unfold it and you get just over 22 square feet of 3/4-inch closed-cell foam to pile on top of your other pads and cover gaps, folds, and irregularities. To top it off, the Pro Spotter is long and wide enough to be used as a camping sleeping pad. If you find yourself requiring multiple pads or boulder in areas with uneven landings, the Asana Pro Spotter is worth considering. It can’t replace a full-size second pad in terms of protection, and isn’t nearly as useful for those that spend their time in areas with flat landings or short problems. You can purchase the Pro Spotter without the case for $95, but we think it’s worth the extra expense for the carrying convenience and ability to use it as a spotting shield to guide a falling climber. Open dimensions: 44 x 72 in. What we like: Large surface area and a lot of foam for a low price. What we don’t: Heavy and lacking in quality. If you take a look at the specs of the Mad Rock Triple Mad Pad, you might wonder why it’s so low on our list. This pad has a spacious 44 x 72-inch landing area, packs down to a slim 22 x 44 inches, has 5 inches of foam, and is only $259. That’s a steal, and the Triple Mad Pad is long enough to serve double-duty as a mattress. What gives? 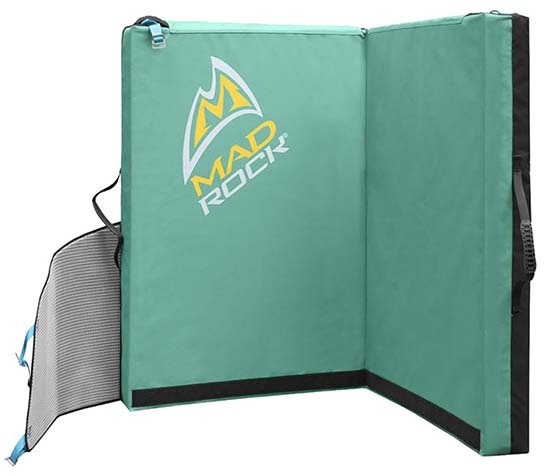 Mad Rock certainly leads the charge in affordable crash pads, but the bigger their pads get, the more their lack of quality becomes apparent. 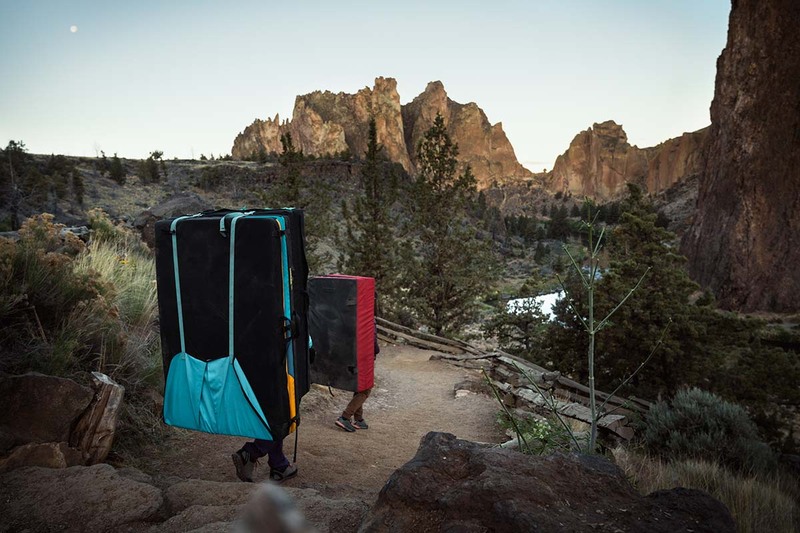 The Triple Mad Pad is a whopping 24 pounds (5 pounds heavier than Metolius’ Magnum) and the durability of Mad Rock’s fabric does not increase to accommodate such a load. Furthermore, the heavy foam (the same as that of the Duo and Mad Pad) will grow soft with use. And like the Recon above, the tri-fold design does not allow you to carry much gear. If you’re looking to go big, we think it’s worth spending up to the higher quality BD Mondo or Metolius Magnum. Open dimensions: 35 x 55 in. What we like: Durable and can conform to uneven surfaces. 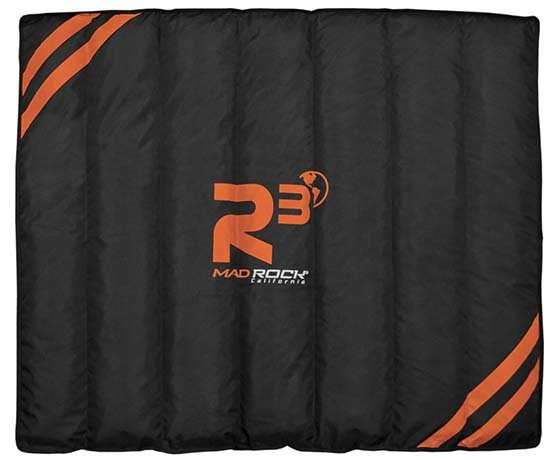 Mad Rock’s R3 is a specialty pad that straddles the full and supplemental categories. Instead of the standard layered open and closed-cell foam we’re used to, the R3 is constructed with seven separate baffles filled with shredded closed-cell foam—think Michelin Man or a down jacket. The benefit of this design is the R3’s ability to conform to uneven surfaces while still providing a cushioned landing zone. Layer it over a jagged boulder, over gaps in pads, or fold it to fill in underneath. And given its flexibility, the R3 also is able to expand to carry gear better than other pads. However, we hesitate to recommend the R3 as a standalone pad for anything but the shortest problems. The lack of a continuous layer of closed-cell foam means you’re more likely to bottom out, and the lumpy baffles make for an uneven landing surface even on flat terrain. In addition, while each seam between the baffling contains a small layer of foam, in essence there are 6 small gutters on the R3 rather than 1 large gutter. And at almost 20 pounds, it has a poor weight-to-size ratio (almost twice the weight of the similarly-sized Drop Zone). 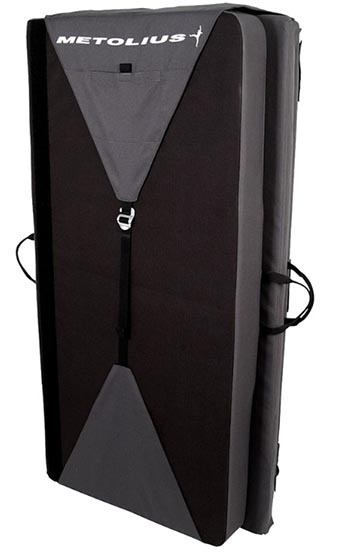 But, the heavy-duty 1680D polyester cover and replaceable foam mean the R3 will keep going long after your other Mad Rock pads have been retired. Open dimensions: 24 x 36 in. What we like: Small and lightweight but still serves a variety of uses. What we don’t: Thin and small. The Briefcase from Organic is a small and easy-to-transport option with a variety of uses. Throw it down as a supplemental pad for extra protection while circuiting, or place it at a start so your feet and clothing stay clean. Fold it to fill in gaps underneath other pads, or drape it over boulders in your landing zone. It’s small enough to fly with and slim enough to slide between the folds of most standard-sized pads. In fact, just this year, Organic lengthened the straps on their larger pads so that the Briefcase can securely ride inside. With just 3 inches of foam and a small 24 x 36-inch surface area, we wouldn’t recommend the Briefcase to be used alone. Additionally, among supplemental pads, the Asana Pro Spotter above is more versatile. But many will appreciate the simplicity and continuous padding of the Briefcase. It might seem like a luxury piece at first, but we think a quality supplemental pad makes a good staple for every pebble wrestler. Petzl Alto $300 Regular 39 x 47 in. 4 in. Taco 12 lbs. 9 oz. Unavail. 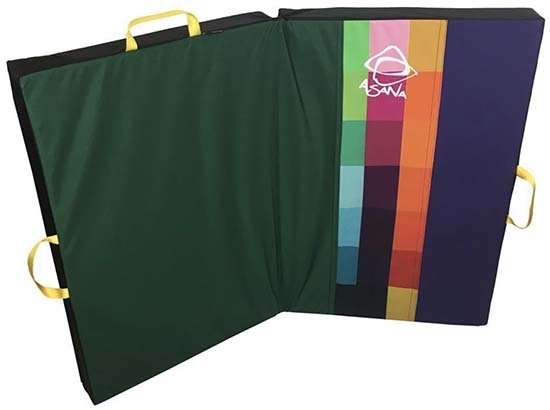 Asana Pro Spotter Pad $120 Supplemental 44 x 74 in. 0.75 in. Hinge 5 lbs. Unavail. Many factors contribute to the amount of protection a crash pad provides, with size being the most obvious. Simply put, the larger the footprint of a pad, the more ground it covers. For short problems or easy circuits where a fall is small or unlikely, many boulderers find one regular-sized pad to be sufficient. 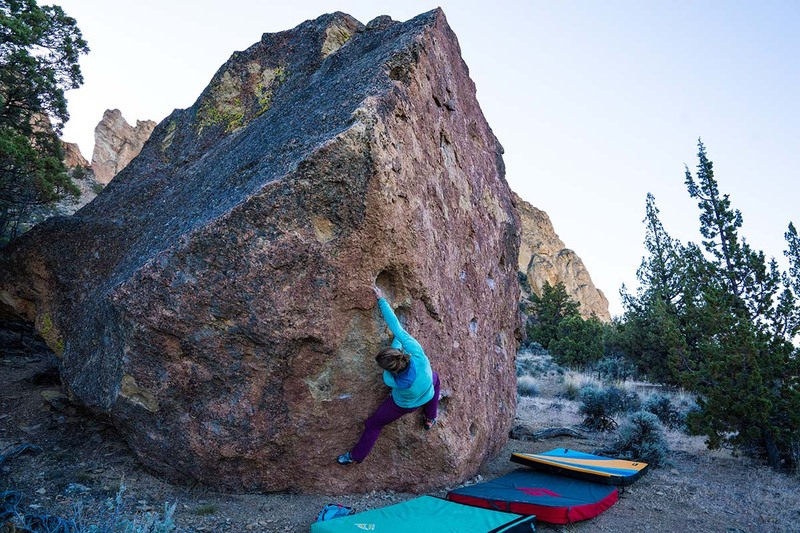 When it comes to highball bouldering, full and oversized pads (and often more than one of them) are favored above the rest. We’ve broken down crash pad size into four categories: supplemental, regular, full, and oversized. Keep in mind that most companies make pads in a handful of different sizes, so you’ll likely be able to size up or down with similar features and quality. Regular pads are your standard, entry-level designs. They average roughly 36 x 48 inches when unfolded and come in the same thicknesses as oversized pads (4 to 5 inches). 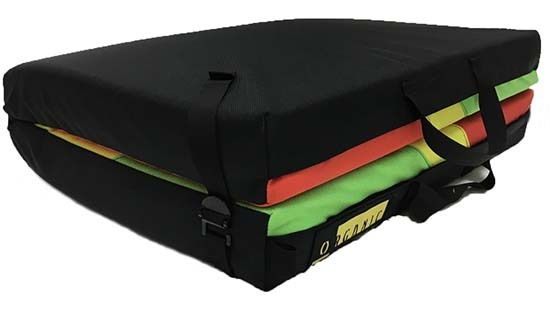 Those new to bouldering or on a budget will find this size to be perfectly sufficient for protecting most problems, and expert boulderers will take them along as a valuable second pad. When you have to carry two pads, regular pads are ideal for strapping onto the back of an oversized pad. Additionally, they are a great size for circuits or bouldering alone on non-committing or easy (for you) problems. For the purpose of specificity, our regular category includes pads up to 13 square feet in surface area. If you’re looking to size up from the regular category above, but don’t want something too massive, full pads provide a happy medium. We think of these as the standard, all-rounder designs of the bouldering world. Lay out a bunch of full pads under a problem and you’re bound to feel safe. Full pads often have more features than their regular counterparts (take the Mad Rock Duo’s carrying prowess, for example, or the innovative tri-fold Metolius Recon). If you’ve been bouldering for years on other people’s pads and feel it’s time to get your own, this is the size we’d point you to first. In this article, we’ve given the “full” designation to pads between roughly 13 and 20 square feet of surface area. With names such as Mondo and Highball, oversized pads can’t hide the fact that they’re the giants of the crash pad world. If you’ll be high off the deck and relying on a pad to protect you, it’s best to err on the side of a very big pad. Regular and full pads—especially linked together (as with the Mad Rock pads) or covered with a supplemental pad—can do the trick, but there’s nothing as reassuring as seeing a 5-inch oversized mattress below you (most but not all oversized pads are 5 inches thick). 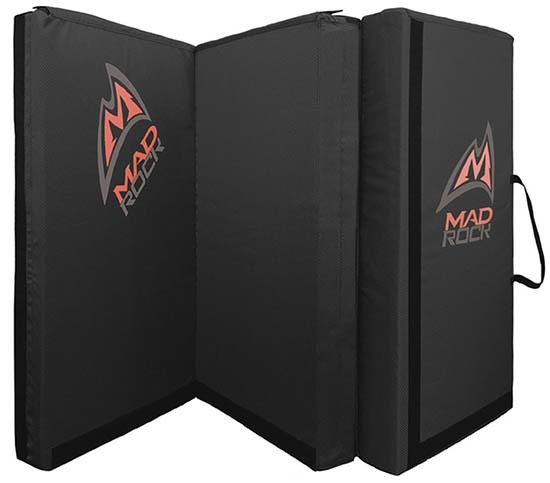 Oversized pads generally are about 48 x 60 inches (20 square feet or more), with outliers like Mad Rock’s Triple Pad extending a full 72 inches. You might be thinking, “Why would I even consider a regular or full pad when I could have an oversized pad?” Oversized pads are expensive and heavy, often pushing 20 pounds. For simple lowball bouldering and circuits, they’re more hassle than they’re worth. Furthermore, oversized pads take up space. More than anything else, the size of your car might determine the pad you purchase. A regular sedan will probably max out with two full pads, and that’s with no passengers in the backseat. Some of the larger pads (the VooDoo Highball, for example, or the Black Diamond Mondo) might not even fit. If price, space, size, and weight don’t matter, sure, pad your problem like you’re in the gym. But most consumers will want to weigh the pros and cons of the various pad sizes. We use the term “supplemental” as a catchall category for pads that are not designed for standalone use. These pads generally have small footprints and are 3 inches or less in thickness. For example, the Organic Briefcase Pad measures 24 x 36 x 3 inches, while the Asana Pro Spotter is larger at 44 x 74 inches but is only 0.75 inches thick. Supplemental pads often are used for sit starts, doubled over to level out a landing zone, or unfolded to cover cracks between multiple pads. We also like these pads for keeping feet clean and dry when bouldering in the mud or snow. Though not to be used alone, supplemental pads can be invaluable when paired with larger pads. When it comes to padding, there are two main elements at play: the types of foam used and the way in which they’re layered. Starting with types, foam can be broken down into two categories: open and closed-cell. As the name states, each “cell” of closed-cell foam is sealed off to the air, making it rigid, firm, and unable to compress much under impact. Open-cell foam, on the other hand, is soft and springy, with cells that allow air to enter and exit. In the absence of pressure, open-cell foam fills with air. When force is applied, these cells release air and provide cushion. While most crash pads are made with a combination of open and closed-cell foam, there are a few outliers, including the Flashed Ronin (Flashed Air Technology) and Mad Rock R3 (recycled EVA foam baffles). The Ronin takes open-cell foam to the next level, with a series of “cells” that each contain a small core of air permeable foam (essentially, a cell within a cell). Because of the membrane around them, this foam takes longer to inflate than the typical variety. In the same way, it takes more time to deflate, allowing for a great deal of cushion. The R3’s baffles, on the other hand, are filled with recycled and shredded closed-cell foam. This pad applies the science of open-cell foam to create a cushioned closed-cell foam—pockets of air in between the small pieces allow the firm foam to provide soft and springy ground protection. And lastly, Organic pads incorporate a continuous layer of durable, comfortable memory foam for premium protection. When you fall onto the pad, you’re hoping for two things: to not bottom out (feel the ground), and to have a cushioned catch. Most crash pads are able to pull this off by combining layers of open and closed-cell foam. Ideally, the top layer of firm foam (closed-cell) takes the force and spreads it out onto the center layer of softer foam (open-cell), which lets out air to provide cushioning. In short, closed-cell foam dissipates the force and open-cell foam absorbs it. Most pads also have another layer of closed-cell foam on the base to further prevent bottoming out and to protect the open-cell foam from moisture and rough ground (closed-cell foam does not absorb water). All of the standard pads on this list are between 3.5 to 5 inches thick. For the most part, the thicker the pad, the bigger the barrier it provides between you and the ground. Pads like the 3.5-inch Black Diamond Drop Zone would not be confidence-inspiring (or safe) under a highball problem, whereas you’ll love seeing the 5-inch Mondo waiting for your fall. As a general rule, the bigger the falls you plan to take, the thicker the pad you should purchase. Keep in mind that pads can be stacked on top of each other for even more protection. 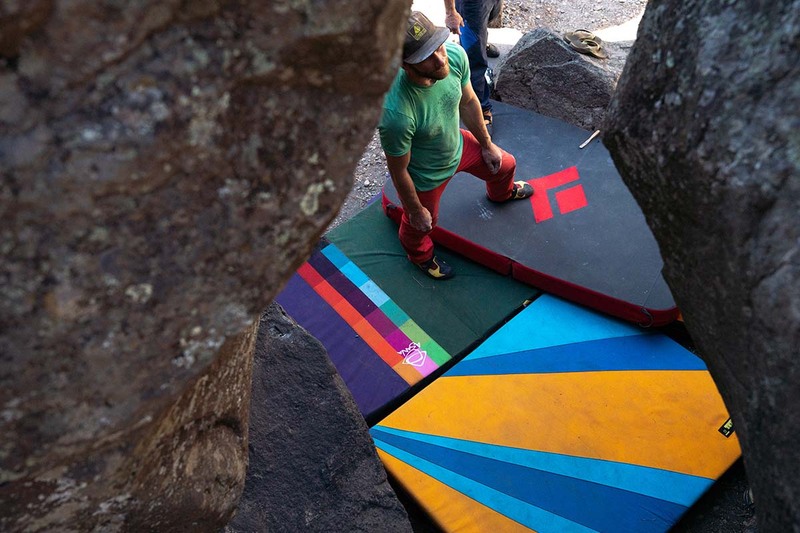 Bouldering pads are designed to fold into a more compact shape for easier transport. While this packability is absolutely essential, it also creates a weak link in the foam. Manufacturers have played with all manner of designs in order to address this issue, and each has its pros and cons. Below we break down the four main types of folds: hinge, angled hinge, hybrid hinge, and taco. A hinge is the most common type of fold on a crash pad. 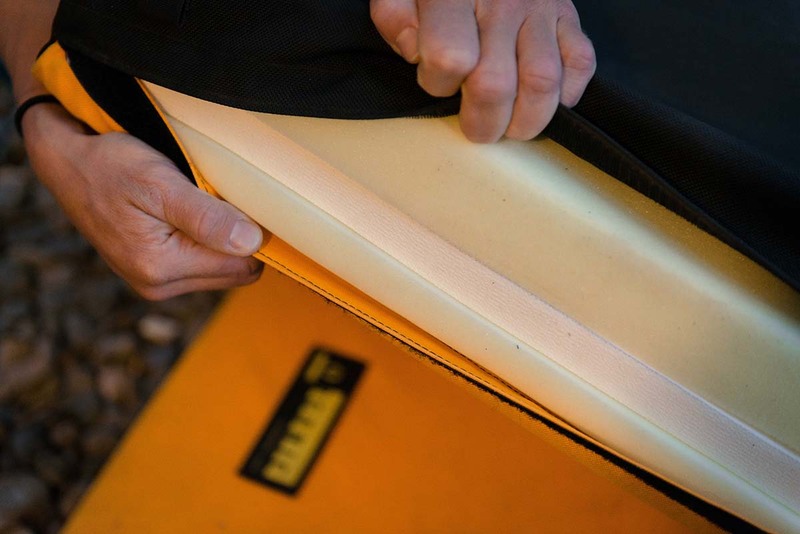 A hinged pad is made up of two completely separate compartments of layered foam connected with a nylon cover, forming a single crease of fabric at the folding point. The benefit of a hinge closure is that no foam is being compressed time and time again in the fold. This preserves the longevity of the pad and allows you to store it folded shut without worrying about weakening foam along the crease. Furthermore, this design allows the pad to fold completely shut, making it one of the most compact of the five systems. The downside, however, of a hinged pad is that a “gutter” can form between the two pieces of foam, especially on uneven terrain. Rolled ankles are probably the most common bouldering injury and gutters often are the culprits. Some hinged pads, like Mad Rock’s pads and the Black Diamond Mondo, are designed with Velcro straps on the bottom to pull this gap together—a good, but not perfect, solution. If your landing zones are rugged, we’d recommend against a simple hinge pad. But for flat ground, this design does the trick. Your chance of hitting the gutter are slim, and in this environment, the benefits outweigh the drawbacks. Metolius is the only company that makes their pads with an angled hinge, but we think they’ve got a good thing going. It resembles a standard hinge with two pieces of foam, but both pieces are cut at angles along one side. This means that when the pad folds out, the top piece of foam extends over the bottom, while the bottom extends under the top. Metolius places Velcro patches on these hinges so that the pad can be sealed flat. This is a smart solution to the hinge problem—again, not perfect (especially on uneven ground)—but close. 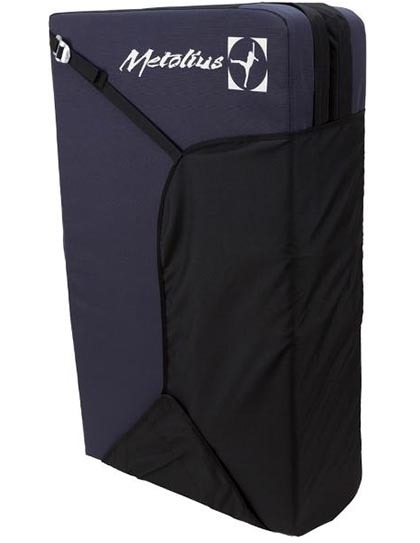 Metolius pads are still compact when closed and can be stored folded without shortening the foam’s lifespan. Pads with a hybrid hinge take the design of a hinged pad and add a thin, continuous layer of foam over the entire top. While 3-4 inches of the pad still fold separately, 1 inch of foam covers the hinge’s gap (similar to the taco below). These pads strike a nice middle ground: they don’t close quite as compact as simple hinge pads, but do so better than taco-style pads. They eliminate the gap of hinge pads, yet not as completely as taco pads. And with foam that is routinely folded, durability becomes an issue (it is best to store these pads open). Strategically, Organic uses memory foam on their Big Pad—the same material we know and love from pillows and mattress toppers—as the continuous top sheet. Memory foam has the ability to compress without losing loft and we think it’s a brilliant material for a hybrid-hinged pad. A taco-style pad is made with continuous open and closed-cell foam that folds in half for transport. As you would expect, taking 4 to 5 inches of foam and folding it is not an easy task, and these pads often require a full body effort to clasp the buckles. The significant benefit of taco pads is that they do not have a gutter, providing one continuous, safe surface to protect falls. 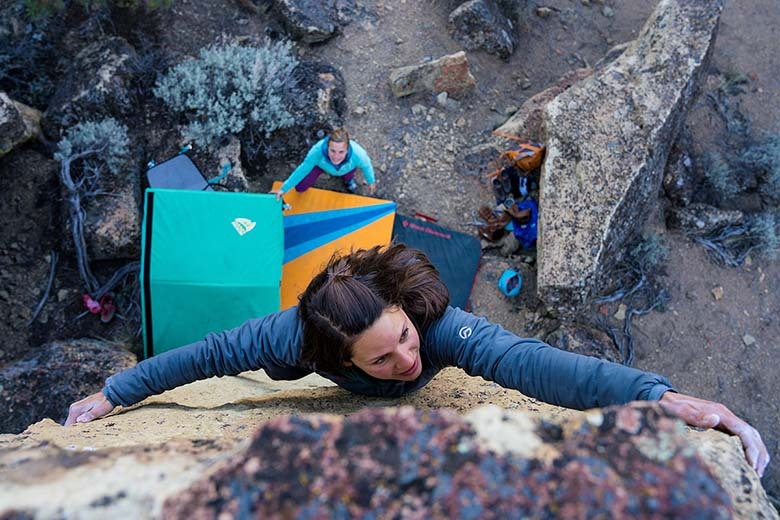 If you boulder consistently in areas with jagged landing zones, a taco pad is especially handy for draping over sharp rocks and mitigating gaps. Plus, because taco pads inherently have a space between the two sides when folded (picture a real taco), they are able to carry a daypack inside better than most. But these advantages come with a list of setbacks. Most taco-style pads do not lay flat when opened—they might need to be flipped upside down or given a few minutes for the compressed foam to expand. Second, they’re usually made of a softer variety of foam than hinge-style pads and are less than confidence inspiring when falling from high. Furthermore, the area of foam that is compressed in the fold will eventually lose its loft, putting the lifespan of a taco pad in question (these pads also should be stored open whenever possible). And lastly, because of the nature of the cumbersome fold, taco-style pads carry slightly off-kilter on your back. Our favorite taco-style pads are made by VooDoo and Flashed. Each pad in this round-up has a slightly different design that allows it to stay folded and closed for transport. The most common closure is comprised of a series of buckles along the side (and sometimes the bottom and top too), which you’ll find on pads like the Organic Big Pad and Black Diamond Mondo. Keep in mind that some buckles are easier to use than others. Asana’s cam straps, for example, are super durable but not as convenient as the hooking buckles on the Mondo. Buckle closures are easy to secure for transport but do not provide a particularly safe compartment to carry smaller items. Some, like Mad Rock’s Mad Pad, have a strip of Velcro at the base to keep items from falling out. Another common system is the flap closure, employed on the Kinetik Newton, Metolius Session, and others. These flaps most often cover the bottom and side of the closed pad, and sometimes the top. Some are secured with buckles and others with Velcro. The benefits of a flap closure are that items can ride inside the closed pad without the threat of falling out, and the flap can be used to piggyback a second pad. Oftentimes, it also folds out to become a doormat for wiping feet or wraps all the way around the pad to protect the suspension system from the ground. This allows you to drag the pad to keep it under the climber without straps getting caught on rocks and roots. Because of all of these benefits, flap closures are our preferred closure design. The final closure system to cover is a zipper, and Petzl’s innovative Alto is the only pad on the list above with this unique design. The benefits of the zipper closure are clear: it creates an ideal carrying compartment for loose and small gear with no threat of items falling out. Moreover, the flap unzips and flips around the pad to protect the suspension system from the ground and create a smooth surface that doesn’t grab on rocks when dragged (similar to, but more effective than, the design of a simple flap closure). This allows the Alto to be used upside down without the suspension system getting in the way if you fall. Durability is the main downside of a zipper closure. Zippers are a common point of failure, and we’ve personally used an old Petzl pad on which the fabric had separated from the zipper, rendering it almost impossible to carry. It can be a bear to close as well, but once shut, the zipper compresses a taco pad better than any other closure system. A suspension system might not be the first feature you think about when buying a crash pad—it’s made to lay on the ground and protect your fall, after all. That said, these pads are large and can weigh up to 24 pounds. With gear and water packed inside, you might be looking at a very unruly, 30-pound pack. Even if you’re just walking 5 minutes to the boulder field, that’s a fairly significant load. For this reason, it’s important to evaluate a pad’s shoulder straps and hipbelt before purchasing. The bigger the pad, the more support you’ll want. Additionally, some allow you to adjust the height of the shoulder straps to get a snug fit, while others are fixed. 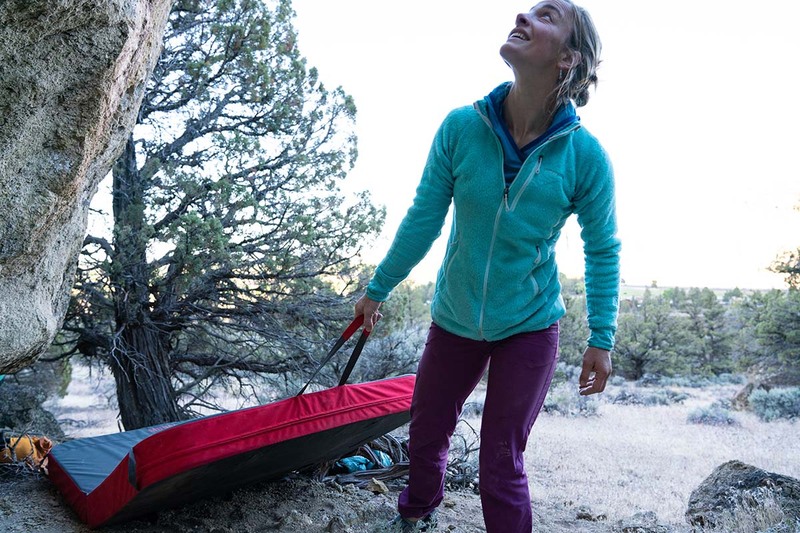 On the extreme end, Organic partnered with Mystery Ranch Backpacks to make a crash pad that carries comfortably enough to take deep into alpine bouldering zones. Once you’ve carried your pad into the boulders, it’s likely you’ll still be moving it short distances under climbers or between problems. Here, pads come with varying degrees of convenience. Some have side shoulder straps, while other have a carry handle at the fold for easy one-handed pickup. Grab handles on the sides or corners also are useful for dragging the pad. We think the Black Diamond Mondo is especially well made for transport, with large over-the-shoulder handles that pack away and four grab handles near the corners. The majority of crash pads weigh between 10 and 20 pounds, depending on size, foam thickness, and features. In general, the weight of a crash pad will not be one the most important specs when deciding on which model to purchase. 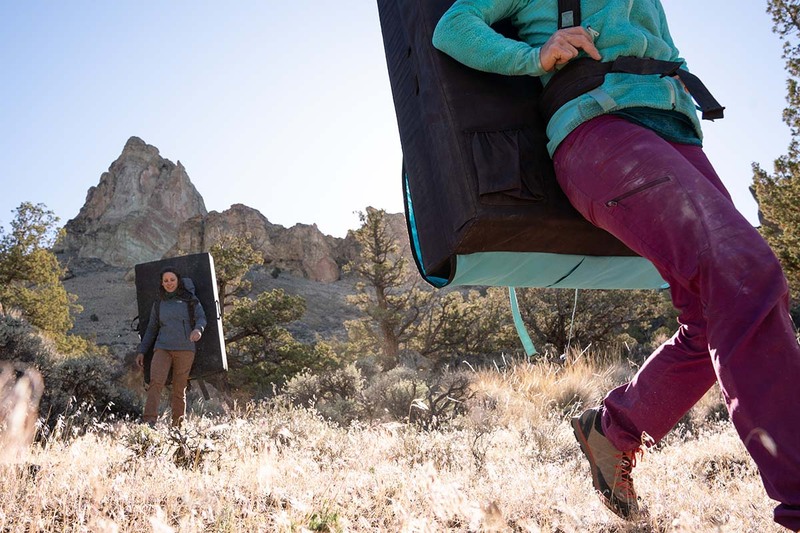 If your climbing style demands an oversized pad, you’ll be content carrying the hefty 20-pound load for the tradeoff in safety. If, however, weight is a major consideration for you, a pad like the Black Diamond Drop Zone is impressively light for its size at 9 pounds 8 ounces, but does compromise some with a thinner 3.5-inch construction. When you have to carry layers, water, rock climbing shoes, and chalk in addition to the huge pad on your back, organization is worth thinking about. Most pads make it possible to stuff miscellaneous items between the fold, with taco pads being the roomiest and triple fold pads the most difficult to pack. You’ll find too that worn in or softer pads accommodate gear better than new and stiff pads. Of course, pads with flaps, zippers, or Velcro on the bottom or sides provide the most secure transport for all your goods. The Petzl Alto even zips closed, so you can throw items of any reasonable size into the pad without worrying about them falling out. Some pads are more fully featured than others in this regard. Common extras include daisy chains or other lash points to hang your gear, water bottle holders (Mad Rock Duo), or a pocket for keys (Metolius Recon). We find that some of these features lend convenience while others are simply overkill. As with most things, it’s a tradeoff. We love the extra carry flap of the Mad Rock Duo for the approach, for example, but once at the boulders the flaps are unruly and cumbersome. Crash pads are durable pieces of gear, designed to be thrown, dragged, stood on, and of course, take falls big and small. All are constructed with a cover that surrounds the foam, and most of these covers are made of nylon. In general, the higher the denier count of the nylon (a measurement of fabric thickness), the tougher it will be. Additionally, pads might feature beefed-up fabric for added protection, like the waterproof coating on Black Diamond’s pads or the reinforced corners of the Flashed Ronin. Kinetik’s Newton, marketed as an all-season pad, boasts a military-grade waterproof nylon bottom. Despite having a burly cover, a pad’s foam likely will be the first thing to degrade. Over time and with extended use, foam has a tendency to grow soft and lumpy. If you have a taco or hybrid hinge pad, it’s imperative that you store it unfolded to lengthen the life of the foam. The good news is that unlike climbing ropes and hardware that can suddenly break, a crash pad will let you know when it’s aging. Pads inevitably grow softer in the break-in period until they reach optimal cushion, and then begin to head downhill into the “too soft” realm. When you start to feel the ground through the pad, it’s probably time to give it a second life as a dog bed. Alternatively, Organic sells replacement foam for their pads, and Mad Rock offers replacement foam for their R3 model. Flying with crash pads is one of the greatest cruxes of traveling as a boulderer. In general, regulation size for a checked bag is 62 linear inches (length + width + height), which dictates that your 4-inch pad be less than 24 x 36 inches. That’s too small to be of much use, so unless you’re willing to pay expensive oversized baggage fees, forget flying with your pads. One notable exception is the Flashed Ronin—its foam cells compress down and pack into a stuff sack. Additionally, Spotter makes the 4-inch thick Airline Pad, but its small surface area means it’s essentially a supplemental pad.